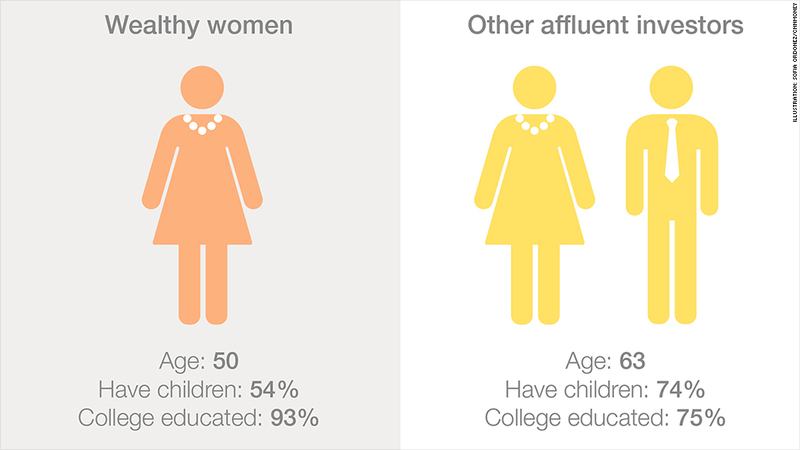 A new report shows that high income women differ from other affluent investors. If you're a woman bringing home big bucks, odds are you're younger, better educated and less likely to have children. The average age of wealthy female investors is 50 years old, according to new findings from Spectrem Group, a consulting and research firm. That's quite a bit younger than other affluent investors, who were an average of 63 years old. The report defines high income women as those whose annual household income exceeds $200,000. Spectrem compares them to "other" wealthy investors, defined as both men and women with a net worth of more than $100,000, excluding this group of high income women. On family: Turning expectations on their head, the report found that affluent women are less likely to have children or grandchildren. A little more than half of female respondents reported having offspring, compared to two-thirds of all other wealthy investors. Spectrem CEO George H. Walper, Jr. said that this is likely because many of these women are very dedicated to their career and are choosing not to have children. The report found that the financial situation of family members -- including children and aging parents -- are the most important personal concerns they face. On school: Women are also more drawn to higher education than the average wealthy person. More than 93% of high-income women have college degrees and 63% have advanced degrees. About 75% of other high-income respondents obtained college degrees, and only 39% have degrees beyond that. On tech: Women are also far more likely to be active on LinkedIn to make professional connections, and more likely to text with their financial advisers. In fact, they're more frequent users of all social media, including Facebook, Twitter, Google Plus, Pinterest, YouTube, Instagram, Vine and Snapchat.